The debate on personal persistence has been characterized by a dichotomy which is due to its still Cartesian framwork: On the one side we find proponents of psychological continuity who connect, in Locke’s tradition, the persistence of the person with the constancy of the first-person perspective in retrospection. On the other side, proponents of a biological approach take diachronic identity to consist in the continuity of the organism as the carrier of personal existence from a third-person-perspective. Thus, what accounts for someone’s persistence over time, is the continuity of his mind on the one hand, and the continuity of his body on the other. In contrast to those views, the paper intends to show that bodily existence represents the basis of selfhood across time, both as the continuity of the experiential self and as the continuity of the autopoietic organism. On the one hand, the lived body conveys a continuity of the self from a first-person perspective, namely a pre-reflective feeling of sameness or a felt constancy of subjectivity. 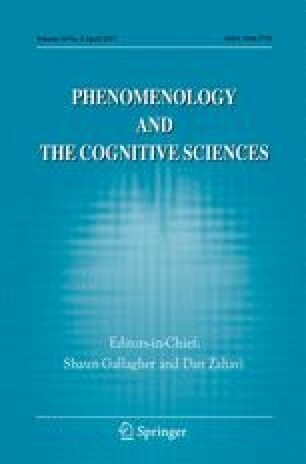 Moreover, an analysis of awakening and sleep shows that there is a continuous transition from full wakefulness to periods of deep sleep which may thus not be regarded as a complete interruption of subjective experience. On the other hand, this constancy converges with the continuity of the organismic life process as conceived from a third-person perspective. Thus, the experiential self of bodily subjectivity and the autopoietic self of the living organism should be regarded as two aspects of one and the same life process. Finally, the lived body also exhibits a specific form of memory that results from the continual embodiment of existence: it consists of all the affinities, capacities and experiences, which a person has acquired throughout his life. Thus, it provides a continuity of self that must not be actively produced through remembering, but rather integrates the person’s entire past in his present being and potentiality. This work has been supported by the EC Initial Training Network “Toward an Embodied Science of Intersubjecitivity” (TESIS, project no. 264828). I am also grateful for the valuable comments and suggestions of two anonymous reviewers. Descartes, R. (2010a). Meditations on first philosophy. Transl. J. Bennett (http://www.earlymoderntexts.com/pdfs/descartes1641_1.pdf). Descartes, R. (2010b). Objections to the Meditations and Descartes’s Replies. Transl. J. Bennett (http://www.earlymoderntexts.com/pdfs/descartes1642_3.pdf).